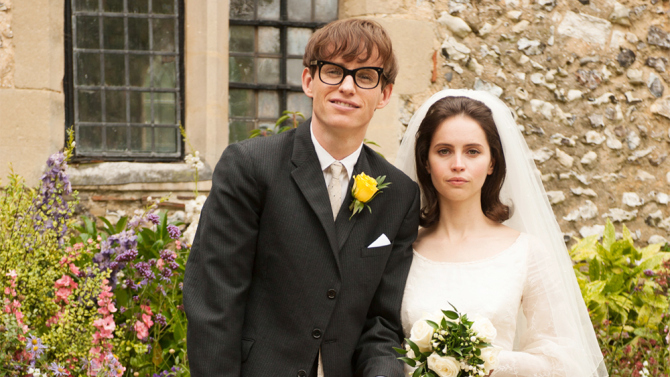 The Theory of Everything, a new biopic about disabled physicist Stephen Hawking, is – against all odds – an intelligent, entertaining and moving piece of work. Hot on the heels of the Alan Turing biopic The Imitation Game comes another very English film about an idiosyncratic scientist with an unconventional personal life and a tragic history. The Theory of Everything portrays the life and work of Stephen Hawking, the physicist and cosmologist who survived an diagnosis of motor neurone disease in his early 20s and went on to write A Brief History of Time, making him one of the world’s most influential scientists. Like Einstein, Hawking became perhaps better known for his life and personality as for his work. Hawking is instantly recognisable for his motorised wheelchair and sing-song robotic voice production machine, and is arguably one of the world’s most famous disabled people. His appearance at the opening ceremony of the 2012 Paralympic Games canonised him as the patron saint not only of scientific enquiry but as an example of triumph over profound physical disability. It’s inevitable, then, that Hawking’s story would one day be brought to the big screen. (A TV movie, starring Benedict Cumberbatch, screened in the UK a few years ago). From Christy Brown in My Left Foot to Jean-Dominique Bauby in The Diving Bell and the Butterfly to Frida Kahlo in Frida and Ray Charles in Ray, stories about real people battling valiantly to live with and despite horrifying illness and disability make great cinema. In a society that increasingly worships physical perfection, disabled characters become increasingly appealing and heroic, as do the loyal family members who nurse sick people and stand by them through difficult times. Not everyone agrees, of course. Disability rights activists complain that disabled people are only applauded when they are shown to be triumphing over their disability, rather than just living with it, and decry the lack of representation of people who aren’t Paralympians or best-selling authors. This is true, but Hawking’s life and work, and even the fact of his survival, is so extraordinary that it can’t help but be inspirational. And so we have The Theory of Everything, a quietly ambitious film that attempts to portray Hawking’s contribution to science, chronicle his battle with motor neuron disease, and applaud the contribution of his valiant first wife Jane. The film opens with the pair meeting at Cambridge in the early 1960s, in a heady swirl of summer balls and family lunches. Soon after, Stephen discovers that he has motor neuron disease, and is given just two years to live. He argues to end the relationship, but Jane persists with marriage and children and all that is feared will follow. The film follows them through 30 years of married life and beyond to Stephen’s controversial decision to leave Jane for his nurse (more on that later). Jane is, the film suggests, the secret weapon behind Stephen’s near-miraculous survival well, who provides him with his other, less well-known theory of everything – love as a reason to live. The film was made with the approval of Stephen and Jane, and you sense the filmmakers’ cautiousness to treat all characters generously and even-handedly. There’s evidence of a lot of narrative streamlining – not just to fit within a two-hour timeframe but to remove anything that would be embarrassing or critical towards the real-life subjects. The Hawkings are portrayed as models of a stereotypically English kind of stoicism and emotional restraint, which is itself a well-beloved cliché of English cinema. Upper lips tremor occasionally and pale blue eyes fill with tears, but there are no screaming matches and no smashed china (though a chess set gets kicked over at some point). Everyone carries on being English and well-bred and speaking in a whisper so as not to disturb the wheelchaired elephant in the room. Even the story’s most extraordinary revelation – that Stephen allowed Jane to pursue a sexual relationship with a family friend for many years – is presented in as sensitive and unsensational a manner as possible. The result is a film that is well-intentioned but misses an opportunity to explore some complex emotional terrain. How did Jane square her religious faith with her ongoing adultery? Was her decision to marry Stephen and look after him really as selfless as it seemed? Or was she striving for her own masochistic form of moral reward? I appreciate the care with which Marsh and McCarten presented sensitive personal material, but sometimes I wished for a slightly more rigorous approach that was slightly less celebratory of emotionally repressed Englishness. It’s worth mentioning that Anthony McCarten’s screenplay is based on the second and much kinder of two biographies Jane wrote about her life with Hawking. Her first book, Music To Move the Stars, published in 1999, was something of a hatchet job, in which she bitterly recounted Stephen’s decision to divorce her and marry his gold-digging nurse Elaine, and questioned her own reasons for staying in a marriage that was exhausting and emotionally unsatisfying. Very little of this anguish is presented in The Theory of Everything, and Jane becomes the more saintly and loyal figure presented in the second biography, written after Jane and Stephen had reconciled. It’s fine for filmmakers to want to focus on the heroic aspects of the characters, but it might have been a more interesting film had they allowed one or two more cracks to show. Mostly, though, the film’s restraint works in its favour. Marsh and his team hold back on too-obvious manipulation of the audience’s emotions, allowing scenes to play out slowly and quietly with a minimum of heart-tugging and let the actors do the heavy lifting. There’s an especially moving scene, played in near silence, where Jane carries in Stephen’s first wheelchair and places it beside him. The camera stays on Stephen for a moment or two while he looks at the chair. We’re able to register every beat of his frustration, humiliation and his quiet determination to face the next stage of his disability. The film’s major asset is Eddie Redmayne, who carries off a difficult role with gravity and extraordinary grace. He captures the various levels of Hawking’s disability with such assurance and accuracy that there were moments where I thought I was watching Hawking himself. More importantly, his portrayal feels real, human and lived-in, rather than a study in behavioural tics. He captures the young Stephen’s strange mix of physical awkwardness and intellectual assurance that made him attractive to Jane. As Hawking descends into almost complete paralysis, Redmayne has only his eyes and face to register emotion, which he does with ease and incredible expressiveness. He has great fun delivering a stream of Hawking’s pithy one liners, and manages to raise laughs with just the raising of an eyebrow. As Jane, Felicity Jones creates less impact, possibly because she has the film’s less fun role. Jones’ English rose appearance and ballerina-like poise seems well suited to portray Jane’s stoicism and forebearance. She soldiers on valiantly from first frame to last, measuring out lip quivers and infrequent tears like a hunger striker conserving her energy. Unlike Redmayne, her character doesn’t get the laughs and she rarely gets a chance to let her guard down or reveal her doubts. It’s a hard-working but oddly anaemic performance, which deadens the action as much as Redmayne enlivens it. I suspect that an older and slightly less blandly pretty actress could have brought more gravity to the role. (Things aren’t helped by Jones continuing to look no more than 20 for most of the film, even as the characters advance into middle-age). There’s far more impact made by Emily Watson as Jane’s mother, and Maxine Peake as creepy nurse Elaine, who insinuate themselves into the film in just a handful of scenes. What a much more interesting film it might have been had one of them played Jane. I expected to hate The Theory of Everything, or at least be washed away by nausea-inducing streams of English Heritage prettiness and disease-of-the-week movie bathos. Instead, I was absorbed, entertained, and ultimately quitemoved. One scene from towards the end of the film (which I won’t reveal here) has stayed with me in particular, demonstrating neatly what only film can do – letting us into the mind and hidden longings of a man we assume we all know and understand, and reminding us that emotional pain continues long after applause has died away. Redmayne’s performance will be hard to beat at the award ceremonies this year. It’s a film that, like its subject, deserves a wide and appreciative audience. Next O, What A Lovely War!